Snakes are efficient tools for image segmentation. They are curves that evolve from an initial position toward the boundary of an object trying to minimize energy criteria. However, they are very sensitive to occlusions and strongly cluttered background. To overcome these kinds of problems, an optimized snake has been developed during this semester project which takes into account some prior information about the shape to outline. Shape information is related to a reference shape defined by the user and described using the same parametric model as snake. Prior knowledge is introduced as a new energy term called shape-prior energy in the snake energy and it is used to prevent the snake from deforming too much from the reference shape. Moreover, shape-prior energy has a parameterizable weight in the snake energy expression allowing the user to determine the trade-off between the convergence toward a shape close to the reference shape and the adhesion to the boundaries within the image. 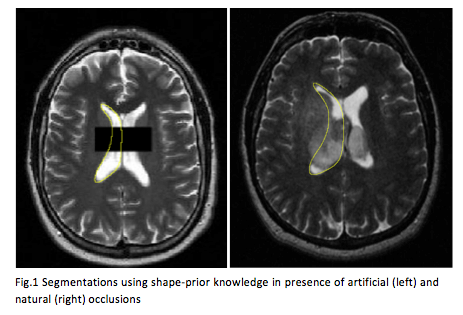 Segmentation examples using prior knowledge are shown in Fig.1. Both cases required a high weight of the shape-prior energy to correctly outline the target shape.